As I was inching alongside other drivers in a typical Los Angeles traffic jam, I spotted a vanity license plate on an older open-top green jeep: “#SURFER”. A board with a sleek red fire bolt was sticking out a diagonal from the back seat. The driver had tousled bleach blond hair and bare tan shoulders. 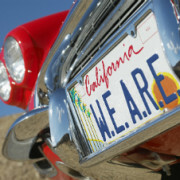 The driver claimed his identity as a surfer, embodying every bit of the message stamped on the back of his car. A vanity plate speaks volumes about a person because there are only 7 letters and characters. It speaks to the essence of your identity or the identity you wish to project. 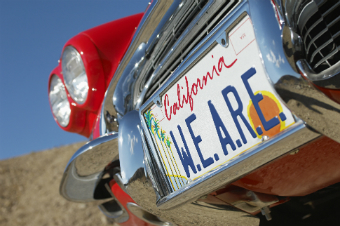 Which got me thinking…What would be on my vanity plate? What 7 letters and characters would sum up who I am, reflect what I do, and how I move in the world? Thinking about my client I was about to meet (while feeling anxious for the traffic to dissipate), I wondered: What would their vanity plate read that would express its company identity? A company’s identity is the sum of their brand, leadership and the collective (everyone in the company). When you think of organizations with firm identities such as Southwest, Nike, and Apple these three components are synergistic and reinforcing. It is no coincidence they are also known for their strong, cohesive cultures. Recently, I settled into my seat in the third row in anticipation of hearing Ari Roisman, Co-Founder and CEO of Glide. Glide, an instant video messaging application was founded in May of 2012 and launched in 2013. Two years later, the app has 20 million users; the company has raised 30 million dollars and employs 65 people. Glide has a bold brand promise: Bring the human element into the digital conversation and transcend the boundaries of communication in space and in time. What was remarkable about this particular evening was literally watching Ari Roisman embody his brand’s highest promise on stage. The format was a fire-side chat with chairs angled toward each other with a host posing questions to the guest. This particular host is known for his incisive questions and irreverent style. After introductions, without missing a beat, the host launched his first question. Ari turned his head slightly away from the host, adjusted his posture, surveying and acknowledging the audience in silence. The host jumped in again. Ari stopped him and said, “I’d like to take a moment to connect with where I am and who I am with.” Experiencing a man grounding himself in his own humanity—first with self and then with the audience of 300 entrepreneurs, before engaging in a public conversation was remarkable. I bet all of this took place under two minutes, yet those two out of ninety minutes still live inside my body. During the conversation, he said, “Any team is a group of people working together and human communication is the most important thing.” He defined human as: “being kind, empathic, thoughtful and respectful.” That answered my question of what motivated him to want to humanize digital communication. Given those challenges, it will be interesting to see how he (and his co-founders) aligns the collective with the brand promise and who he is at his core. I suspect because he is a robot across the world, this will only continue to fuel his ambition to humanize all digital communication across time and space. How can you discover your company’s identity? Start by considering these questions. What is the highest promise your brand makes? Look at a different industry. What brand within that industry do you most and least represent? How do you choose to allocate your time? Your money? What do you value most in yourself and other people? What are the traits of your highest performers? What do your team members expect from each other? The danger of not having a clear company identity, especially during rapid growth, is that you are at risk of diffusing your brand, being reactive as a leader and hiring the wrong type of people. When your company identity is firm, it provides predictability that builds trust with your customers and internal team. Alignment and trust is the foundation of building a cohesive culture. What would you imprint on your company license plate? You only get seven letters, so make each one count. What do your Rituals say about your Company Culture? What do your Toilet Stalls say about your Company Culture?